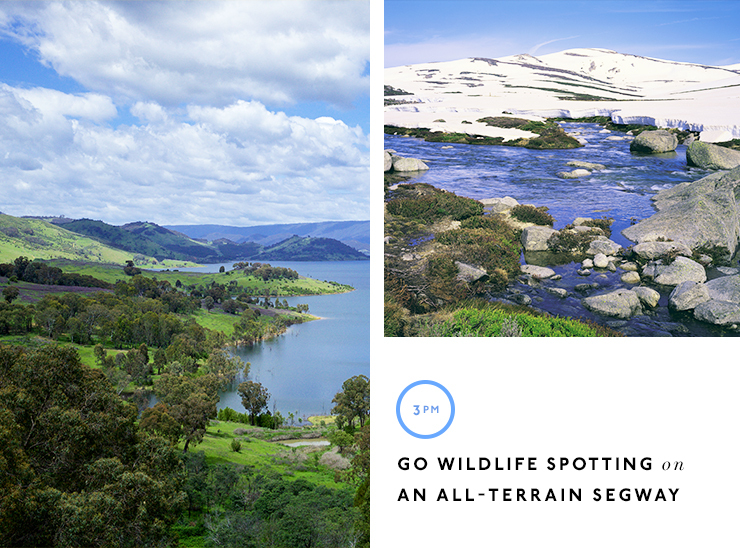 The Snowy Mountains are one of New South Wales’ worst kept secrets—we all know that they’re there, and we’re happy to head down for a cheeky weekend of skiing, but how about when there’s no snow? Well guys, last weekend, we decided to find. Spoiler alert: turns out, a lot happens. 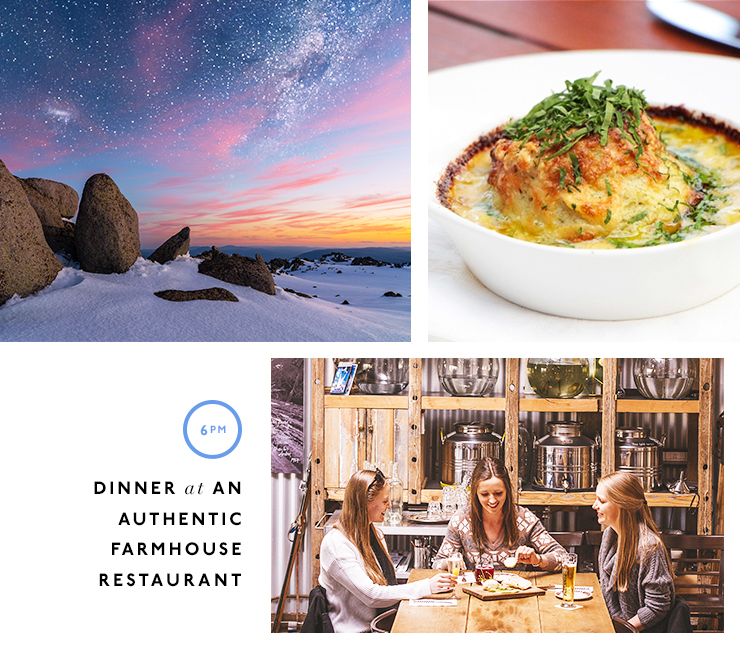 We’ve teamed up with Destination NSW to give you the 411 on how to spend 48 hours in the mountains—you’ll be busy, but everything is far too beautiful (and delicious) to miss. One of our biggest tips (which also happens to be free) is to look up at night. Seriously, we bet that you’ve never seen this many stars in your life. If you’re feeling like a high roller—or just had your 2014 tax return come through—then you can book yourself a flight to Canberra. This will decrease your drive time by a few extra hours and also give you a chance to shamelessly over spend at the airport, which is no doubt one of your favourite things (or is that just us?). 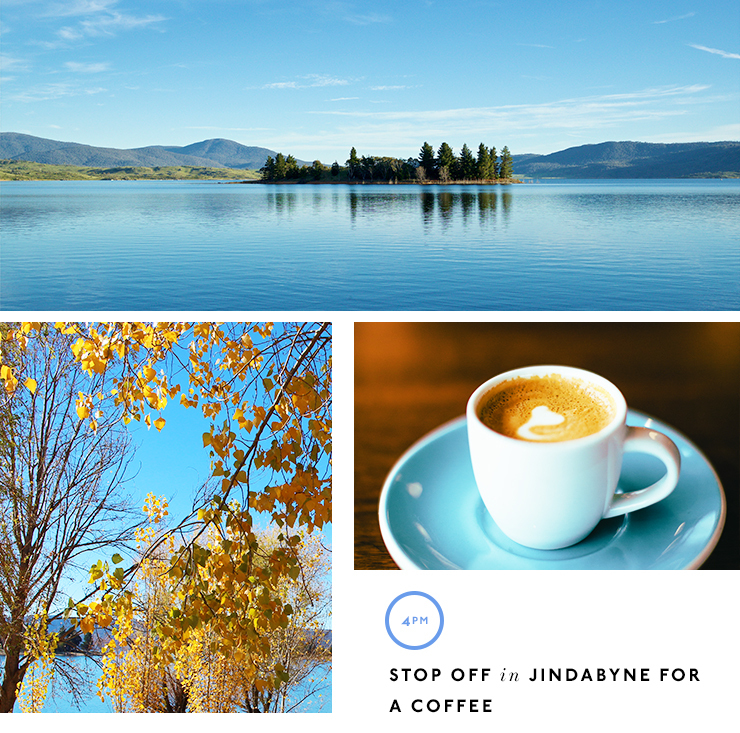 On your way to Lake Crackenback, stop off in Jindabyne for a coffee and a long look at the beauty that is Lake Jindabyne. If you head here in winter, then you might see snow blanketing the banks, but in autumn, the golden leaves are a pretty stunning contrast to the bluer-than-blue lake. For a cheeky coffee and treat, head to Birchwood—the staff are friendly, the Single O coffee is divine and they have treats for every allergy and intolerance #winning. Check into your super luxe chalet at Lake Crackenback Resort & Spa, drop your bags and then wander down to Cuisine restaurant for dinner. Director of Food & Beverage, Jean-Michel Gerst serves only the freshest seasonal fare—every guest in the restaurant was raving about the duck, so we recommend that you go with that along with your well earned glass of vino. Saturday morning means only one thing—breakfast buffet at the hotel. There is seriously nothing we love more than a buffet breakfast (it’s a tie with wine, obviously), so load up guys, because it’s going to be a big day. Head for the mountain and book yourself in for a mountain biking class—the instructors are experienced and the mountain is beautiful. We did the beginners class and stopped off for a hike into the forest half way up to check out the waterfalls. Ask for JT, tell him I sent you and assure him that you’ll be a far better mountain bike rider than I was (not hard). As long as you’re there for the views, the fun and all of the LOLs, then you’ll be just fine—promise. Once you’ve mastered the mountain, take a foodie pit stop at Central Road 2625. Located in Thredbo’s Village Square, the service is friendly, the food is delicious and the coffee is everything you need on a chilly day in Thredbo (we had two). You can grab a quick baked treat from the cabinet if you’re keen to get straight back to the adventures, or settle in for a seriously delicious lunch. 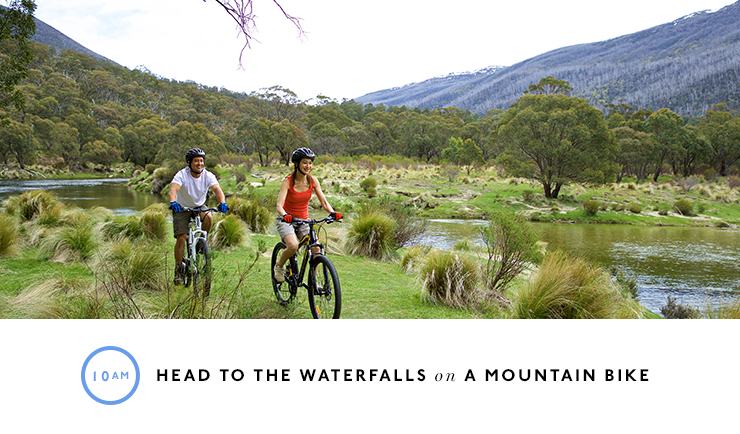 After you’ve thoroughly exhausted yourself at Thredbo, make your way back to the hotel and take a little nap. Or just head straight for the spa and book yourself in for a one-hour massage or mani/pedi—whichever grabs you in the moment. You’ve earned it—so go nuts and do both. Once the sun goes down, and the ridiculous stars come out to play, drive down the road to Crackenback Farm for dinner. The dining room is all wood errrything, just as you would expect from an authentic farmhouse restaurant. There’s plenty to look at on the walls, but the food is definitely the main event—start with sourdough dipped in olive oil, then move onto the twice baked three cheese souffle, and the roasted pork belly with chorizo and borlotti bean sauce for main. We don’t believe in rushing on a Sunday morning, so once you’ve eaten all that you can at the breakfast buffet, head for the activity centre at Lake Crackenback Resort & Spa to book in for a Segway tour. Warning: it’s impossible to look cool on a Segway, but it’s also impossible to have a bad time. These all-terrain Segways are awesome and you’ll spend the hour spotting native wildlife, off-roading through the resort and having far too much fun. We made two stops on the way to the airport, because it’s impossible to choose between schnapps and wine. First, we did a schnapps tasting at the Wild Brumby Distillery, where you’ll sip all of their award-winning schnapps and no doubt tuck into their food menu as well. If you’re after something light, then go for the vego soup, but if you want something more substantial, then the impressive cheese board—The Distiller’s Plate—should be followed up with the Austrian beef goulash. Pass through Berridale on your way to the airport (or Sydney, if you’re driving the whole way) and pop into Shut the Gate cellar door to chat with Rich and Rasa. You can blindly choose any of their premium wines and be sure that it’ll be good—we loved the pinot gris, Riesling, rosé and shiraz (you get the point). Keen skiers and wine experts, they know their way around a great drop and their light-filled garden will easily see you lose hours here playing garden games and sipping wine. Check in for your flight back to Sydney and book another trip to the Snowies for three-months time—you’ll be craving the fresh air by then, we promise. Destination NSW also have a pretty sweet prize pack up for grabs and all you have to do is head here, then upload your favourite holiday videos and photos, using #ILoveNSW. Editor's note: This article is proudly sponsored by Visit NSW and endorsed by The Urban List. Thank you for supporting the sponsors who make The Urban List possible. Click here for more information on our editorial policy.